However before I come to that, I want to mention some potentially exciting developments regarding the Medieval Canterbury Weekend. As a way of attracting young people, Dr Diane Heath and I had a meeting on Wednesday with Lyndsay Ridley, General Manager of The Canterbury Tales in St Margaret’s Street. Although in its early stages, we are hoping that on the afternoon of Friday 6 April 2018 we can hold jointly a story telling session in the garden behind The Canterbury Tales. Costumed characters will tell medieval tales, possibly about daring knights, wandering pilgrims and maybe even the odd dancing bear, its owner reported for taking it out for a walk along Canterbury’s city wall. Thus, we will introduce children to exciting episodes about medieval life, giving the tales a Canterbury twist because they will be based on events and/or people who feature in the medieval documents to be found in Canterbury Cathedral Archives and Library. I think this may grow to involve further child-centred activities, so please keep watching out for reports as things develop. ‘Saturn’s Roar’ [provided by The Canterbury Tales]. 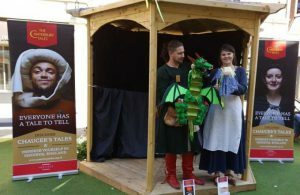 To engage a somewhat younger audience, we are intending to extend this partnership to bring in Waterstones for the morning of Friday 6 April by taking The Canterbury Tales’ puppet show to the book store. This puppet show, called ‘Saturn’s Fury’, involves a poor dragon who has lost his roar and his mission to recover his voice. 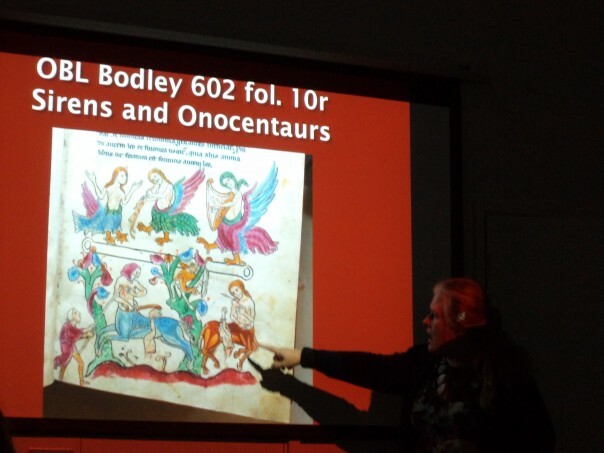 Diane, who studied the medieval bestiary for her doctorate, is especially interested in this activity, not least because she has worked previously in children’s education. Again, please do watch out for more details and I’ll let you know when tickets go on sale. Turning from primary school children to those at the top of secondary, I am in consultation with teachers at the King’s School about possible workshops at Canterbury Cathedral Archives and Library. 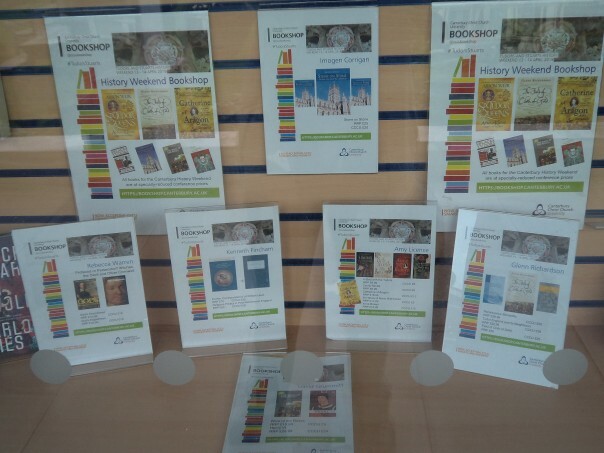 This collaboration worked very well with sixth formers studying classics last year and the intention this year is to branch out to take history sixth formers as well. This is another exciting development because there is almost nothing better than introducing people to the ‘magic’ of original documents, perhaps written 500 or 600 years ago, to illuminate the lives of people – townsfolk and their rural counterparts, not just those of kings and queens and their aristocratic followers. Queen strut roof in Debenhams – see if you can find it! Another new development I attended this week was the first postgraduate research seminar where two of Canterbury Christ Church’s history doctoral students gave presentations on an aspect of their current studies. Some of you may remember Janet Clayton because she is a member of the Kent history postgraduate research group and has in the past talked about her work on Scadbury manor. On Wednesday, she focused her presentation on Ruxley Hundred, in particular the detailed lay subsidy assessment of 1301. This is a fascinating source, albeit not without problems because it is not clear exactly what level of possessions are being recorded – is this all stock or just the householders’ surplus itemised for tax purposes? Nonetheless used carefully and with certain caveats it is giving Janet ideas about local farming practices, but, more importantly for her study, clues about relations between this area of north-west Kent and London. To do this, she is concentrating on a number of families who had London connections, especially those of merchant/gentry status. All of this was extremely interesting, but from a personal perspective I was especially interested in what this material seemed to be saying about the make-up of the area’s plough teams – the mix of oxen and horses, as well as how these may have been organised collaboratively among several households. 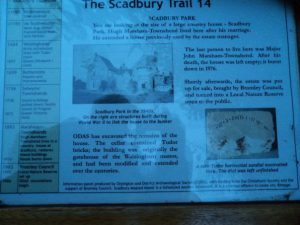 Sign board telling part of the history of Scudbury manor. The second presentation by Dean Irwin took us to the muniments in the Leicester archives. He is working on the Jewish communities in England during the 12th and 13th centuries and on Wednesday he was focusing on two charters that relate to the acquisition of land by Isaac of London and Rouen in c.1189. This case is in itself remarkable, Jews were normally confined to money lending in this period, but in addition the acquisition seems to concern the Jewish community, not just an individual and/or certain family members. These special circumstances appear to relate to William de Ferrers’ need for money to leave on the Third Crusade with Richard I, and may similarly explain the king’s role in this transaction. The land acquired was at Thurrock in Essex, so just across the Thames estuary from Janet’s Ruxley Hundred, and concerned the manor there which involved a mill among other appurtenances. Where the charters were drawn up is not clear, but the witness lists show that both Jews and Christians were present – another interesting feature. As is the Hebrew text used to identify the charter, perhaps Isaac’s means of cataloguing it within his collection. Both presentations were extremely interesting and illustrated the value of close reading of documentary sources. The audience definitely agreed from the number of questions each speaker fielded afterwards. Drs Leonie Hicks and Simon Prince, who organised the evening, were equally pleased and intend to organise similar events in the future. David Birmingham with the Lord Mayor and Sheriff. Returning to where I started, I thought I would offer a very short report on the presentation to David Birmingham. 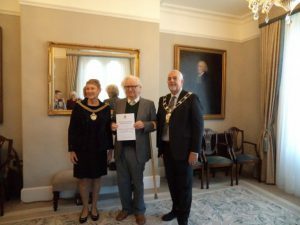 The event was held in Canterbury City Council’s Tower House in Westgate Gardens, and as well as the Lord Mayor and Mayoress, the Sheriff was also present. After various introductions, the Lord Mayor began the presentation by reminding her audience about John and Peggy Hayes and their particular interests in the history of the city. Indeed, John was also interested in St Stephen’s to the north-east of the city and if he hadn’t died soon after retiring he probably would have completed a history of that parish. He died several decades ago, but Peggy died only a few years ago and most of the audience, as well as David, had known her well, thereby adding an extra dimension to the morning. David Birmingham and the Award certificate. 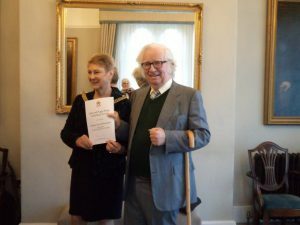 Dr Doreen Rosman then gave the citation, explaining that David is a long-standing expert on African history, and has recently published another study on Africa, focusing on modern Angola and taking it up to very recent times. He has also written a book on the history of village life in Switzerland, a response to growing up in Switzerland and the knowledge he gained about rural society when working on Africa. Such cross-fertilization of ideas is partly responsible for Canterbury before the Normans. For having retired from the University of Kent, David became a city guide and therefore gained a considerable knowledge about Canterbury’s history. Again drawing on his African expertise, he became increasingly interested in the city and its hinterland’s prehistory and when Mary Berg and Doreen Rosman started on their histories of Canterbury (Mary from the Norman Conquest to the Reformation, Doreen from the Reformation to modern times), David decided he would fill in the earlier gap. 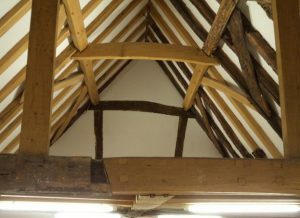 This meant he needed to get to grips with the dozens of archaeological reports produced by Canterbury Archaeological Trust, as well as the Trust’s considerable published studies. For anyone who isn’t an archaeologist this material can be extremely challenging, but David mastered it and by using other published sources, such as The Archaeology of Kent, edited by John Williams as the first volume in the Kent History Project series, David has been able to synthesize it all to produce a very readable account. Thus, David Birmingham is a very worthy winner and if you haven’t read this book, I would recommend that you search it out. I shall end here but I hope to be able to announce some very exciting news in the blog next week – so please do watch this space!